Stride by Stride: Panda Cam, Panda Cam, Panda Cam!!! 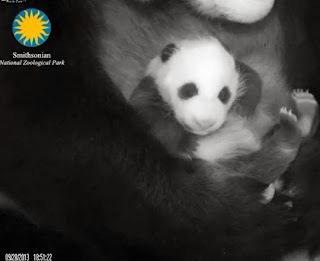 The Smithsonian National Zoo's panda cam is my sweet, guilty secret. Many a day has gone by wherein my floors remained dirty, my clothes unlaundered and my bathrooms down-right icky, simply so I can savor a few extra moments watching THE PANDA CAM! Inspiration comes in strange places. Empowerment often hides in odd corners or just off in the shadows. I'm not saying that I like ogling the empty corners of mama Mei and baby Bao Bao's den quarters; I much prefer live-feed panda interaction. But even those lifeless, hidden pockets (the areas not viewable through the camera's discerning lens) offer me small patches of solitude, peace and comfort. Three ingredients I find helpful in trying to rev-up my own engine and adjust my attitude on any given dank day. Recharging and aligning yourself with empowering mental and emotional spaces need not be noisy or flashy. That's what I've learned. In all the tiny, seemingly insignificant moments that I've sat and waited, pondered and wondered where baby and mama have disappeared to off-camera, what they're doing? I also find my mind unfolding and roaming to far away places, a different time. China, the place...panda bear species inception, the time. What happened, besides a miracle, clearly, hello! I realize in these moments of reflection that this is how a girl empowers herself, even when the odds are stacked against her. One moment at a time. One innocuous, seemingly unimportant piece of life passing by. Learning to hold onto the everyday moments, enables an understanding which perpetuates the strength to power through at difficult, unyielding, all-consuming times. Animals teach people so much. Much more than any conversation propelled by human language can hear or discern. They teach us the importance of looking inward for answers. The significance of trusting your own instincts in spite of external chaos. The beauty of knowing that because you exist you deserve to be valued, loved and counted; regardless, of whether or not life's invisible, constant camera lens is pointed directly at you, revealing all your strengths and weaknesses. Tell Mei and Bao Bao, I said hello, and thank you!